Lionel James is one of the smallest players to don football pads in the NFL, measuring up at a tiny 5’6″, 172. The running mate to Bo Jackson in Auburn’s wishbone, James was a virtuoso, who had soft hands, speed, and great vision, playing runningback and returning kicks for the Tigers. 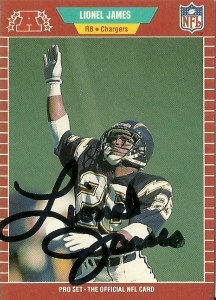 Lionel was chosen by the San Diego Chargers in the 5th round of the 1984 draft, where he fit right into the offense run by Dan Fouts and coached by guru Don Coryell. A devastating returner, Little Train had 1488 yards from scrimmage his rookie year, with a league leading 959 yards coming on 43 kick returns. He also had 30 PR and a 58 yard touchdown. In his second season, (1985) the team officially committed him to running back, where he was part of a 3 headed monster with Tim Spencer and Gary Anderson. 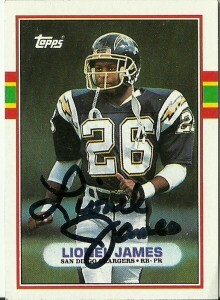 James had a monstrous 1985, setting the then NFL record for yards from scrimmage with 2535 yards, while also setting the then NFL record for most yards receiving for a runningback with 1027. Little Train’s 516 yards rushing also led the team and in a game against the Raiders, he fell only 28 yards short of Billy Cannon‘s 373 all purpose yards in a single game, (set in 1962). As injuries finally caught up to Lionel in 1986, his all purpose yards slid to 806 in 1986, but he rebounded in 1987 with another 1136, in only 12 games. James played one final season in 1988, tallying 606 yards from scrimmage, but the wear and tear had caught up to him, and by the time the 1989 season rolled around, his career was over after really only 5 seasons.